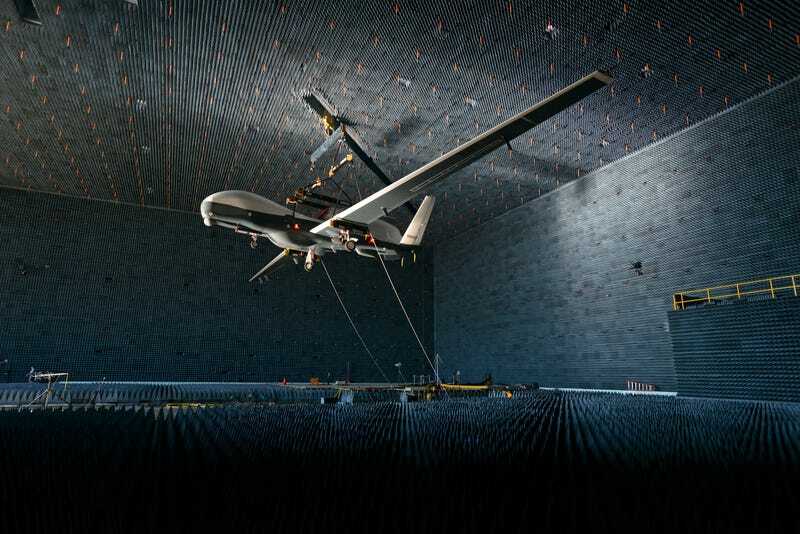 The Navy’s MQ-4C Triton Broad Area Maritime Surveillance drone is seen lifted inside NAS Patuxent River’s anechoic chamber earlier this month. The test was unique as it was the first time ever that a vehicle was controlled via an external ground station while undergoing electromagnetic compatibility testing in the chamber. The testing will take over two months to complete and will verify that all the aircraft’s subsystems can operate without interfering with each other electromagnetically. It is a process most military vehicles go through but it is especially critical to combat aircraft as their sensors and emitters are becoming more powerful and sensitive than ever before, and some can even be used as weapons themselves. This CV-22 Osprey is shown undergoing testing at Elgin Air Force Base’s smaller anechoic chamber. There are only a handful of such facilities scattered around the U.S. The anechoic chamber, just one of the many exotic testing facilities that support American weapons development scattered across the U.S., gets its bizarre appearance from the thousands of cones that cover all its interior surfaces. These cones deaden electromagnetic emissions, keeping them from bouncing off walls and keeping stray external signals from interfering with tests. These sound-stage like structures are like stealth buildings on the inside. Depending on the configuration, they can be used for everything from systems integration testing, to musical recording, to radar signature testing, although the most advanced, purpose-build radar signature testing anechoic chambers can look even more exotic in nature than what you see here. (we will cover them in an upcoming post). The anechoic chamber at NAS Patuxent River is truly massive, but the largest in the world resides at Edwards AFB. Known as the Benefield Anechoic Facility, the chamber is large enough to accept any aircraft in the world, or multiple aircraft at once if the testing demands it. It is made up of 816,000 pyramid foam structures to deaden any radio frequency signals that careen through the massive 250 foot deep by 264 foot wide by 70 foot tall chasm. Inside engineers can hang their subjects from the ceiling using gantry cranes, or they can place them on a 160 foot wide turntable that can spin 1,000,000 pounds of machinery through 360 degrees. Aircraft as large as the B-52 and B-1 have been tested in the Benefield Anechoic Facility with plenty of room to spare and America’s next bomber, the LRS-B, will most likely be tested there as well, if a prototype has not already visited the facility. Here you can see the cousin of the Navy’s MQ-4C, the RQ-4B Global Hawk being tested at Edwards AFB’s huge anechoic facility. These amazing facilities are quite literally the quietest places on earth, and the precise engineering and systems development that are accomplished within their four walls is just as interesting as their crazy, almost sinister yet futuristic appearance. They stand as just one more reminder of the incredibly shy, yet complex weapons development apparatus that supports America’s military capabilities. A good part of winning in any conflict occurs in obscure facilities like these long before the first shot is fired, where we get a edge over our competition through advanced engineering and science.